Growing bonsai trees is so much more than a fun gardening project. Bonsai is an amazing, living art form that requires a lifetime of care and commitment. People are often so intrigued these majestic miniature trees that they want to learn this skill themselves. Your desire to learn how to grow bonsai trees may have already led you to do a great deal of reading on the subject. The logical next step is to find a skilled instructor who can offer tutoring and advice. Recently, LoveToKnow had the opportunity to speak with one such instructor. John Capobianco, an instructor and bonsai artist who teaches at Hicks Nurseries in Westbury, New York, has been working with bonsai for 17 years and has won awards for his amazing work. 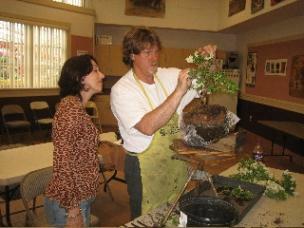 He offers insight on growing bonsai trees for beginners in the following interview. John Capobianco: Bonsai is a horticultural art form. The objective of bonsai is to create a stylized representation of a mature tree in miniature. We work with all kinds of trees, everything from Arctic birch to Brazilian cherry trees. As long as the plant can adapt to the techniques of bonsai; living in a container, shaping, pruning, root pruning, etc.I have seven pieces that I am proud to display. Dozens more are in various stages of development. I also create chrysanthemum bonsai, which only last for one season. I usually create about two dozen of them each year just for my own enjoyment and competition. JC: Bonsai are very much like dogs and cats. They need to be watered, groomed and fed. These activities are done regularly throughout the year. Seasonally, the roots must be inspected to see if the tree is becoming pot-bound and if necessary the roots are trimmed. Branches need to be shaped using pruning and wiring techniques, so the branches must be inspected to avoid wire scarring. Overly long branches need to be cut back. JC: Read books to develop a vocabulary. Then take lessons with a qualified instructor. With the guidance of a good instructor, a bonsai can be created from scratch in a matter of hours. On your own, it can be quite a daunting task. What are the best trees to start with? JC: That all depends on your ability to care for a tree. For indoors we quite often recommend the ficus because of its ability to adapt to very low light levels and to suffer a wide range of abuse without dying. For outdoors, juniper and Japanese maple are good starter trees. What trees are the most challenging? JC: Pines and beech are the most challenging, in my opinion, along with chrysanthemums and anything being grown in the shohin size (under 10 inches) range. How long do bonsai typically live? JC: The life span of a bonsai depends on the habits of the species and the owner's ability to provide proper care. Pines are very long lived, where cotoneasters are short lived plants. Which are best suited to keep indoors? JC: Indoor growing year-round is very difficult on plants. 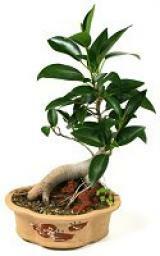 The best indoor varieties are ficus, schefflera, azalea and Kingsville boxwood. Can any tree become a bonsai? JC: Technically, yes. However, some trees object to the techniques; namely northern oak species like pin, scarlet, white, black, etc. JC: I have barely scratched the surface on the subject of growing bonsai trees. I've been in the art for 17 years and I am still learning and adjusting my techniques. Bonsai is a very regional hobby. What works on Long Island doesn't necessarily work in Clearwater, Florida. The best thing to do is to read books to get a good vocabulary and learn basic horticulture. Since bonsai is an art form, the principles and elements of design are important as well, and can be learned from basic art classes. Studying different tree forms in nature is also very helpful. Bonsai is often described as the ultimate art form because your work is never complete. It is constantly growing, evolving, changing, requiring your attention and discipline to keep the tree alive and looking good. LoveToKnow would like to thank John Capobianco for taking the time to do this interview.